Regular trainings help bus drivers meet fuel economy targets. Photo by Prashanth Bachu. With input from Prashanth Bachu. Bus-based public transport that is dependent solely on revenue earned from ticket sales is typically not a profit-making business. Most bus agencies strive to meet operational costs in other ways, and fuel economy has been recognized as a significant strategy that contributes towards operational efficiency. However, systematic and targeted steps towards improving fuel economy has not received too much attention, in part owing to the fact that bus maintenance agencies understandably place their primary focus on providing adequate service and safety to passengers. Vishakapatnam’s bus transit agency, the Andhra Pradesh State Road Transport Corporation (APSRTC), has been achieving an efficient 5.22 kilometers per liter (kmpl) on its city routes over the last decade, thanks to improved operational efficiency. This is contrary to the popular belief that fuel economy is solely dependent on vehicle maintenance or purchasing new buses with improved technology. Operational efficiency saves the corporation close to 9 percent of the total cost of operations. This reduction in fuel use not only saves money, but it also has positive implications on the environment. A World Bank guidance note on bus operational and maintenance procedures praises the merits of enhancing the energy efficiency of city bus transport. This note is a practical guide to implement a program to enhance fuel efficiency, directed at city transit managers and their technical staff, mainly in developing countries. The APSRTC has developed a system of its own and achieved phenomenal results. An intentional strategy that involves a variety of best practices has made this possible. According to APSRTC’s Regional Manager Y. Jagadeesh Babu, “Achieving fuel efficiency targets is 70 percent managerial, and only 30 percent depends on the condition of the vehicle.” Although the corporation does face challenges of its own, it is committed to improving its services with a specific focus on fuel efficiency. While Vishakapatnam has good roads, there is also a conscious effort made by each driver to achieve fuel economy targets. Trainings and periodic audits play an important role in helping drivers meet their targets. In part, these trainings were developed by drivers who had achieved exemplary fuel economy. Drivers having the best safety record and highest fuel economy are appointed as “Safety Driving Instructors.” Their experiences have been translated into developing best practices for other drivers to follow. 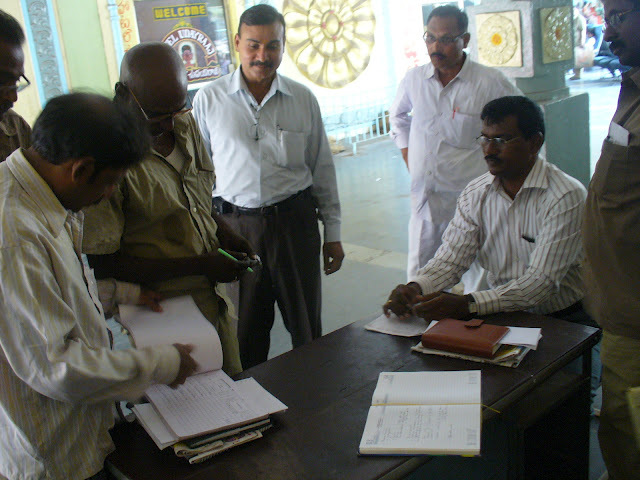 At APSRTC, each driver is required to maintain a “KMPL Book,” which is a daily record of kmpl achieved. The drivers are assigned, as far as possible, to the same bus and the same route. This helps the drivers to “connect” with the vehicle, aids in better maintenance, and reduces surprise breakdowns. Driving along the same route helps the driver familiarize himself with the route, knowing where to slowdown for sharp turns, speed humps, as well as traffic conditions. Knowing ahead of time exactly when to accelerate or when not to reduces fuel wastage caused by the unnecessary use of brakes. C. Ramakrishna, Depot Manager, Simhachalam, who is a keen advocate for achieving the best fuel economy rates, says, “Our drivers are trained to drive close to the average speeds prescribed. They do not over-speed or use the brakes frequently. In essence, they control the bus with just the accelerator.” Additionally, the drivers switch off their engines at traffic signals, which increases fuel efficiency by 8 percent to 12 percent. APSRTC’s Vishakapatnam division currently runs a system of 1,080 buses, of which 650 are run exclusively for city operations, managed by 3,400 staff, including 1,400 drivers. V. Srinivas, Depot Manager, Gajuwaka, talked about some of the challenges he faced: “While the average fuel economy for regular city buses is 5.35 kmpl, we have been able to achieve only 4.96 kmpl with the 153 new JnNURM-funded buses.” This has resulted in reducing the overall average to 5.22 kmpl. While a higher fuel economy is a benefit in itself, APSRTC’s operational best practices have also resulted in better bus maintenance, longevity of buses, and a reduction in repair costs. Increased safety and reduced traffic crash rates are other side benefits. Lessons can be learned from APSRTC in Vishakapatnam, which would help city bus transit agencies improve their transport services, passenger safety, financial viability and environmental impact.